Did you know that Africa outranks the United States and the United Kingdom in terms of the percentage of entrepreneurs among women? In fact, research indicates that Sub-Saharan Africa has the highest rate of female entrepreneurship across the globe, with more women starting businesses in Africa than anywhere else in the world? The reason for this can be ascribed to various factors, the most relevant being that many women don’t have a choice. The economic reality in South Africa is that many households cannot be sustained by a single income and therefore there is a need to make extra money on the side, even if women are employed. This year marks the fifth rendition of the very successful Enterprising Women Programme (EWP) as presented by the North-West University’s Vaal Triangle Campus (NWU Vaal) in collaboration with Aequis Consulting. 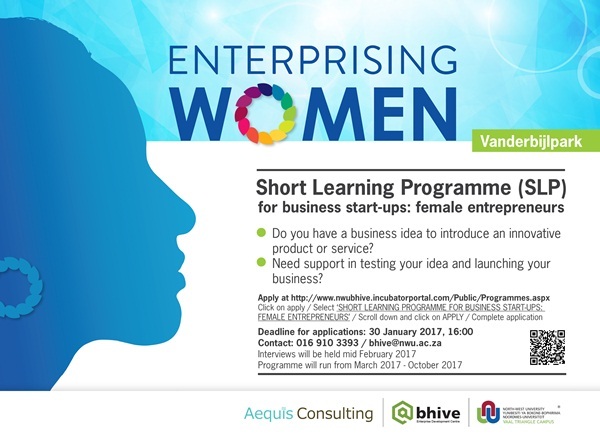 The aim of this short learning programme is to assist start-up female entrepreneurs to achieve their goals and realise their business dreams. In short: to empower female entrepreneurs to overcome challenges and to develop their business ideas into relevant, sustainable and income generating enterprises. The Enterprising Women Programme is an eight month programme geared to provide business support services to women who wish to establish their own businesses. During the course of the programme, participants will be taken through a programme to explore ideas, develop business models and subsequently initiative their businesses with confidence and entrepreneurial know-how. “A female entrepreneur works hard every day to realise her goals, be it to support her family, to supplement her income or, to turn her hobby into a viable business,” explains Johann Landsberg, Manager of the bhive Enterprise Development Centre (EDC) on the Vaal Triangle Campus. The bhive EDC represents the hub in which the short learning programme is presented. Since its inception in 2015 the programme has grown with leaps and bounds and has in recent months also been extended to Sasolburg and Pretoria. The programme represents an NQF Level 5 certification and interested women only need grade 12 and basic computer skills to apply. The programme coordinator is Leonie Greyling, an entrepreneurship development professional, and together with a team of experienced presenters – representing both academia and the business sector, the programme offers women the opportunity to give flight to their dreams. Interviews will be conducted during February and the programme will run from March to October.